Long Beach, Calif. – July 15, 2014 – Following success in the first four Formula DRIFT events of the 2014 season, Ford Motor Company is leading the points in the manufacturer’s standings through the efforts of Mustang drivers Vaughn Gittin Jr. and Justin Pawlak, ranked third and sixth, respectively, in the driver’s championship. Gittin Jr. and Pawlak will compete in customized Ford Mustangs in Monroe, Washington, this weekend, July 18-19, in round five of the seven-event series. Ford has supported drivers in Formula DRIFT since 2005, when the sport triggered a successful Ford Racing Performance Parts engine development program for a supercharged 4.6-liter V8 crate engine. The first official drifting series in North America, Formula DRIFT has taken competitive motorsports to the extreme, attracting enthusiasts from all walks of life. Highly-skilled drivers maneuver high-powered cars into controlled slides at high speeds through a marked course. Judged on speed, execution and style rather than fastest time, drifting is a crowd pleaser that’s often compared to the freestyle nature of skateboarding and motocross. This season’s competition features pro drivers and teams running seven events. Judged on speed, execution and style rather than fastest time, drifting is a crowd pleaser that’s often compared to the freestyle nature of skateboarding and motocross. 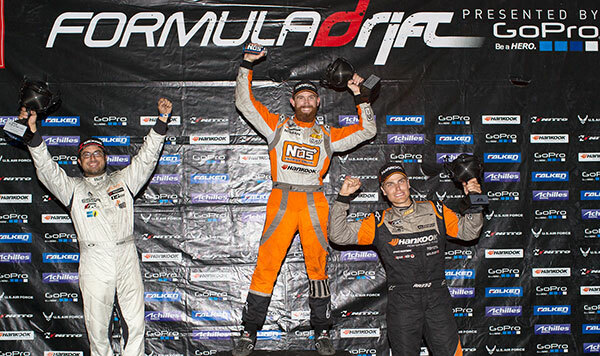 The 2014 Formula DRIFT season will continue with Round 5: Throwdown at Evergreen Raceway on July 18-19. For more information visit: www.formuladrift.com and find Formula DRIFT on Instagram @formulad, Facebook www.facebook.com/formuladrift and Twitter @FormulaD. Long Beach, Calif. – July 21, 2013 – Formula DRIFT presented by GoPro returned to the Pacific Northwest to a sold out crowd. 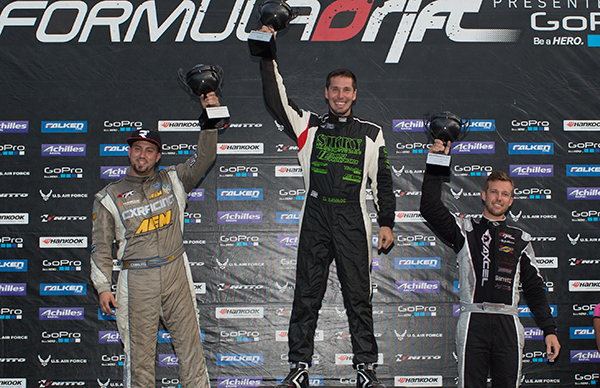 Chris Forsberg in the NOS Energy Drink / Hankook Tire Nissan 370Z takes the victory and the championship points lead. The fans came out in droves for Round 5: Throwdown at Evergreen Speedway and for the second year in a row the event was held in front of a sell-out crowd. Heading into the event, returning champion Daigo Saito had a commanding points lead, but with an early exit in the Top 32, an opening for the other drivers became present. In the consolation round, Aurimas “Odi” Bakchis in the Nexen Tire Nissan 240SX battled Fredric Aasbo in the Hankook Tire / Scion Racing tC. Wheel and tire problems helped give Aasbo the win and the third place finish. The final battle pitted Michael Essa in the GSR Autosport / Yokohama BMW M3 against Chris Forsberg. After a close battle, Forsberg edged out Essa to take the victory and the lead in the 2013 Pro Championship points standings. Essa also moves into second place overall. With only 2 events remaining the championship is up for grabs with less than 35 points separating the top five drivers from the title. Formula DRIFT continues to Round 6: Showdown at Texas Motor Speedway in Dallas Fort Worth, Texas on September 13-14, 2013. 2011 Formula Drift champion Daijiro Yoshihara gets back into action at Evergreen Speedway in Monroe Washington for the 5th round of the series. But…on his first qualifying run he scores a zero… Dai is in 3rd place in overall standings just behind Daigo Saito and leader Justin Pawlak. He needs to score high at this event in order to improve the chances of defending his championship.